Red Ted and the Lost Things. By Michael Rosen. Illustrated by Joel Stewart. Candlewick, 40 pp., $16.99. Ages 3 and up. Few picture-books authors write more honestly about loss than Michael Rosen, the former British children’s laureate. His Michael Rosen’s Sad Book was the rare book for its age group that dealt successfully with multi-layered adult grief — the pain its author felt when his 18-year-old son Eddie died from meningitis. 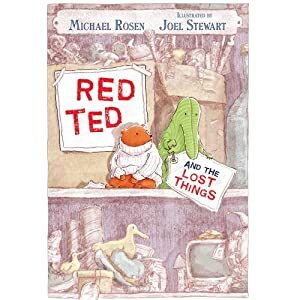 Now Rosen has returned with a lighter story about loss: a tale of a brave red teddy bear who must find his own way home when his young owner accidentally leaves him on a train seat and he ends up in a cavernous lost-and-found department. That premise alone would set this picture book apart from many others in which lost toys are reunited with their owners through children’s diligent search-and-rescue efforts. So the new friends follow the “Way Out” signs in the train station and begin their journey – an optimistic teddy bear and a pessimistic crocodile, who fall in with a helpful cat who has some of the traits of each. It’s a much quieter trip than the rip-roaring family adventure in We’re Going on a Bear Hunt, a book that includes an unexpected snowstorm. And its pleasures are gentler: Joel Stewart affirms the bond between the animals, despite their differences, by using bright colors only for the three traveling companions and a sepia- wash for the background. And by the time the three find Stevie, this book has become more than a quest narrative: It is a story about the value of teamwork and how people of different of temperaments can work – and, in the end, live – together happily. Best line/picture: Red Ted and the Lost Things has an inventive spread that consists of one-and-a-half blank pages (with art only at the bottom of the second page), which appears when the characters seem to have run out of ideas for finding their way home. Worst line/picture: None. But you wonder why Steve calls her mother “Mom” instead of “Mum” when the signs follow the British model (“Way Out” instead of “Exit”). About the author and illustrator: Rosen was the British Children’s Laureate from 2007–2009. He is best known in the U.S. for his acclaimed We’re Going on a Bear Hunt, which he performs in an excellent video. He collaborated on Michael Rosen’s Sad Book with the great illustrator British Quentin Blake. Joel Stewart lives in England and has illustrated Lewis Carroll’s Jabberwocky. You can also follow Jan Harayda (@janiceharayda) on Twitter. She reviews children’s books on Saturdays on One-Minute Book Reviews.